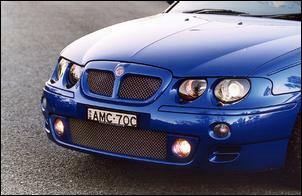 Is the MG ZT a pretender, a car that attracts the eye with its 18-inch alloys and 225/45 rubber, body kit and badging - but has nothing to back it up? Pity the poor importer trying to break into the Australian market. Note only do they have to establish brand cred, but they've also got to woo dealers on board, attract a stream of potential buyers to the showrooms, and bluff their way past unanswerable questions about retained value. 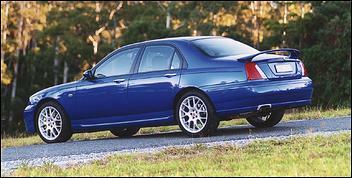 At least MG Rover Australia does have a good car to sell - if the ZT wore a BMW, Lexus or even Volvo badge, it'd be assured of success. But despite the sales of the MG-F, with MG brand history being attractive only to people well on the wrong side of 40, the ZT is very likely to struggle. And that's a little sad, because in many respects it is an excellent package. But, it must be said, it's also a confusing one. 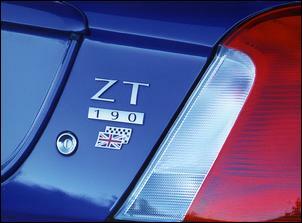 In this market the ZT has only a modest amount of power for a sporting car. The badge may say '190', but that's not in kilowatts, it's in PS. And 190 PS translates to just 140kW - in a body weighing 1485kg. The result is acceleration that takes around 9 seconds to reach 100 km/h - barely faster than any off-the-shelf family Australian car, and a mile off the pace of the performance cars in this market. Literally, you wouldn't want to line up a Holden Barina SRi, a car that costs one-third as much. 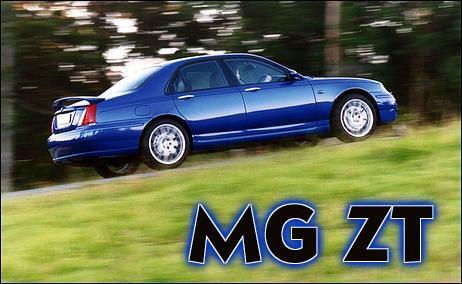 So is the MG ZT a pretender, a car that attracts the eye with its 18-inch alloys and 225/45 rubber, body kit and badging - but has nothing to back it up? 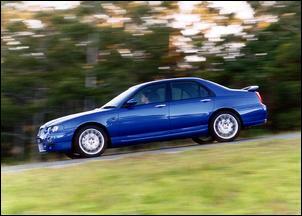 In fact, on a winding road the ZT is a blisteringly fast car point to point, its suspension (heavily modified over the donor Rover 75) allowing the tyres to grip and grip and grip. The ZT is front-wheel drive and has no traction or stability control systems - but instead it's got a wonderfully developed chassis. The steering is almost perfect in this type of car - well-weighted, precise but never nervous. The lack of weight transfer on turn-in and through switch-backs, the immensely tractable engine, the car's wonderful on-road composure - all these traits make the ZT feel more like a $80 or $90,000 car - not one $10 under $60,000. And then there are the brakes. 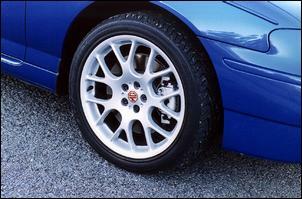 Whopping ventilated discs, the fronts span 325 x 25mm and are gripped by big callipers and are backed up by 276mm discs. Working with Bosch 5.7 4-channel ABS and electronic brake force distribution, they're immensely strong, have good feedback, and in an emergency stop pull the car down hard. In fact it's worthwhile exploring a bit further the changes MG Rover engineers have made to the 75's suspension. The 75 was originally designed with major input from BMW, when the German company owned Rover. So the base suspension - MacPherson strut front and Z-axle rear - is already well sorted. But for the ZT, front spring rate has been altered to 37 N/mm, rear to 58 N/mm and Delphi 'digressive' two-stage dampers employed - the front dampers also featuring internal rebound springs to increase roll resistance. The front anti-roll bar is 25mm in diameter (up by 1mm), with the rear increased by 4mm to 23mm. In addition, there are solid suspension subframe mounts and stiffer suspension bushes. The 18 x 7.5 alloys carry very sticky 225/45 Michelin Z-rated Pilots. Unfortunately - and despite radial noise absorbers being fitted to the rear hubs - the amount of road and tyre noise entering the cabin is high, probably as a result of those solid subframe mounts and harder bushes. 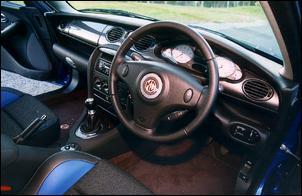 That delightful steering is a result of a rack unique to the MG - it features a 16.4:1 ratio resulting in 2.86 turns lock to lock. Unusually these days, the ratio is linear. Under the bonnet you'll find a transverse 2.5-litre V6. Developing its 140kW at a high 6500rpm and peak torque of 245Nm at 4000rpm, the engine is a sweet but torqueless revver. 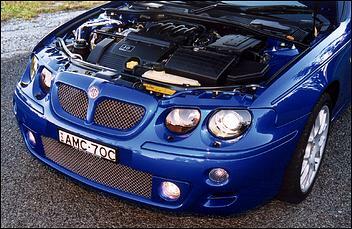 Despite a very extensive list of revisions for the ZT - larger intake manifold runners, revised inlet porting, new inlet cam, bigger piston pins, larger exhaust and variable flow rear muffler, revised ECU mapping and a larger radiator - the manual-trans ZT develops only 8 per cent more power than the Rover 75. Torque is up by just 2 per cent... And the shape of the torque curve of the engine is also largely unaltered - both peak torque and power occur at identical revs. Perhaps someone got cold feet well into the development process? At least the new exhaust gives the car a wonderful exhaust note! And despite MG Rover suggesting that the engine is happy to run on anything from 90 - 98 RON fuel, on normal unleaded we could hear some detonation at times, quickly settling as the knock detector pulled back timing. However, the 2.5-litre does have a trait that suits itself admirably to the chassis: there's never that rush of torque that in nearly all performance front-wheel drives can unsettle the car. So in the ZT you'll find no torque steer, very little traction problems, and no sudden surges of understeer when cornering on the throttle. Instead it's a case of winding out the engine to the 6750rpm (soft) rev cut, flicking the short-throw gear lever from slot to slot - and leaving your foot nailed to the floor. Keep the entrance speeds up and get on the power early and on a demanding road the ZT can be flowed along very quickly. And, despite the firm ride resulting from the stiffened suspension, bad mid-corner bumps usually don't upset the poise. The exception is when the suspension is already compressed and then a sharp, difficult bump is met. The car still stays composed - but there is a loud thump as the suspension on that corner hits its bump-stop. The only time that the ZT's handling degenerates is on the tightest of hairpin corners - there it can get inner wheelspin, and start power-sliding at speed towards the edge of the road. The rear isn't especially throttle steerable in these conditions either. But it needs to be stressed that the ZT only does this when provoked - in all other cornering conditions its composure and reassurance are pronounced. Inside the cabin, space is at a premium. With the body's high waistline, low seating position and very narrow foot wells the ZT feels a little claustrophobic. People with large feet will find it difficult to drive, as the driver's left foot needs to be slid under the clutch pedal and then to the left before it can access the footrest - there isn't room to move your foot past the edge of the clutch pedal. The distance between the brake and the accelerator - wonderful for heel and toeing if you have feet small enough - is also too tight for those wearing large shoes. With the front seats right back, rear knee room is atrocious, while backseat occupants will also have to put up with looking out at the C-pillar. However, moving the front seats forward a little still gives adequate room for front occupants and dramatically improves rear conditions. In contrast, the boot is large and contains a full-size spare wheel. The rear seat back folds down as one piece (although it doesn't lie flat) and additionally has a ski-port. The equipment level in some respects is outstanding for the dollars being paid: there are no less than six airbags, the headlights are self-levelling high intensity discharge designs with washers, and the seats are excellent. On the downside, the air con is manual, the sound system a single CD radio, and while there's cruise control, it surges unpleasantly when activated. If you're happy with the straight-line performance and compact interior, there's not a lot wrong with the ZT. It has a wonderful chassis, a surprisingly high level of passive and active safety, and a sweet engine. At $60,000, it's also good value for money. 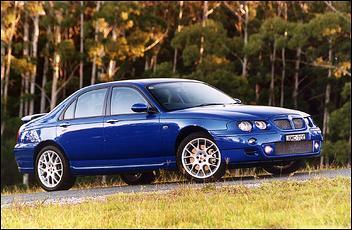 The MG ZT was supplied for this test courtesy of MG Rover Australia.